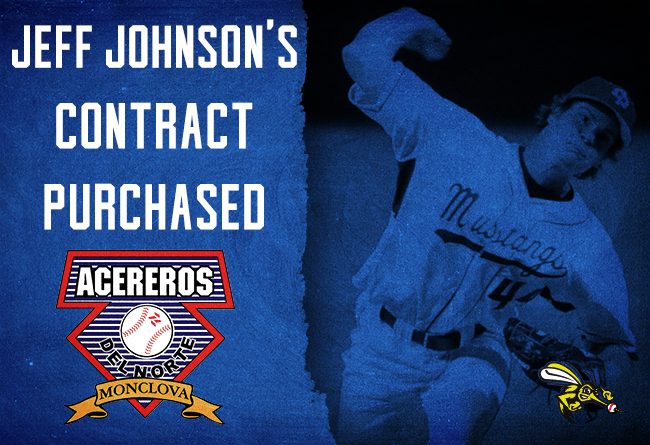 (Sugar Land,	Tex., April 19, 2018) – The	Sugar	Land	Skeeters	announced	today	that	pitcher Jeff	Johnson’s	contract has	been purchased	by	the	Acereros	de	Monclova	of	the	Mexican	Baseball	League. Johnson	was	entering	his	first	season	with	the	Skeeters	and	his	sixth	in	professional	baseball. The	28-year-old	right-hander	spent	the	2017	season	with	the	Cleveland	Indians	organization	at	Triple-A	Columbus. In	50	relief	appearances,	he	went	2-1	with	a	3.27	ERA	and	three	saves	while	recording	65	strikeouts. The	Indians	drafted	Johnson	in	the	10th	round	of	the	2011	MLB	Draft	out	of	California	Polytechnic	University,	San	Luis	Obispo. The	Thousand	Oaks,	CA native	has	spent	all	five	of	his	professional	seasons	at	the	minor	league	level	with	the	Indians. Through	240	career	minor	league	appearances	(all	in	relief),	he compiled	an	11-10	record, 2.74	ERA	and	56	saves	in	266	⅓	innings. He	was	second	in	the	Eastern	League	with	27	saves	in	2015	while	with	Double-A	Akron	and	logged	50+ innings	in	each	of	his last	three	seasons. The	Skeeters	will	continue	to	finalize	the	team	roster	during	the	remainder	of	spring	training	and	open	the	2018	season	on	April	27th at	Constellation	Field	against	the	New	Britain	Bees,	with	first	pitch	at	7:05	p.m. Individual	tickets	are	available	now	at	SugarLandSkeeters.com,	our	mobile	app,	and	at	the	TDECU	Ticket	Office	at	Constellation	Field. For	more	information,	call	281-240-4487. Visit	SugarLandSkeeters.com	and	follow	us	on	Facebook,	Instagram	and	Twitter	(@SL_Skeeters)	for	all	the	latest	news	on	the	team. The	Atlantic	League	has	been	a	leader	in	professional	baseball	and	a	gateway	to	Major	League	Baseball	since	1998. Over	38	million	fans	have	attended	Atlantic	League	games	and	more	than	900	players	and	50	managers	and	coaches	have	joined	MLB	organizations	directly	from	the	ALPB. The	Atlantic	League	emphasizes	winning	baseball	games,	showcasing	the	talent	of	top-caliber	players	and	offering	affordable	family	entertainment.